Throughout scientific history, many technological advances have been made. In the year 2014, there are so many different types of imaging systems for the brain and so many different angles the brain can be seen in. An MRI looks at the structure of the brain- tissues and cross sections of the brain; a PET scan looks at molecular information of the brain; and a CT scan looks at bones and soft tissues. The technology I would be creating would be somewhat of a high resolution camera that would be able to see specific neurons in the brain and how they are intreating with one another. Assuming technology has majorly advances at this point in time, this camera would be able to capture these neurons in a cross section, much like an MRI, so a neurologist would be able to clearly see each section of neurons. Let’s take this into a real world situation- an MRI has located an issue within a specific part of the brain, or even a tumor. 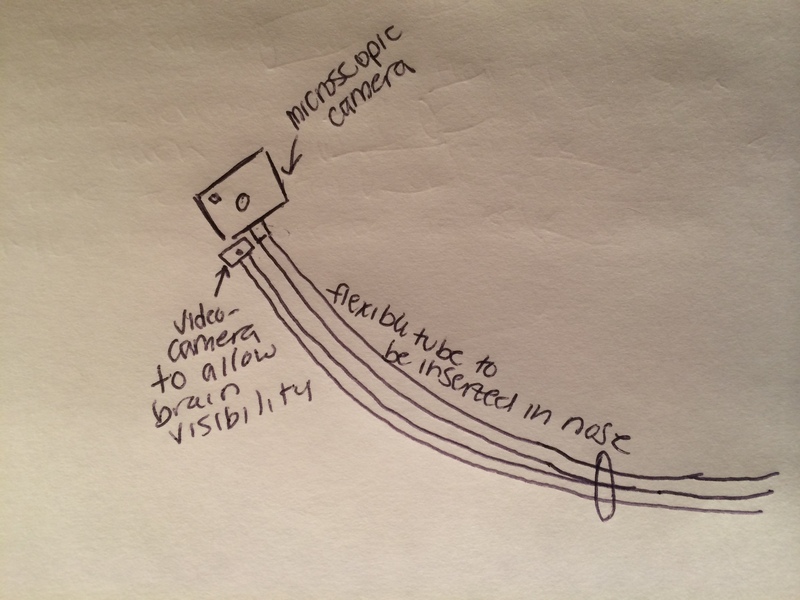 This camera would be able to go in and capture neuronal activity. This would allow the neurologist more insight into the problem the patient is having. Now, the whole point of this camera is so brain surgery does not have to be performed until further knowledge is gained, so there would have to be a noninvasive way the camera went in- possibly through the nose and into the brain that way. As stated before, technology would have to be extremely advanced for this to happen. The first thing that needs to occur is a camera that can capture photos at that level of high resolution, almost at a microscopic level. The next thing in the series of advancements would have to be this microscopic camera that would be small enough to fit through the sinuses into the nose. I assume this would not be as difficult because we already have cameras this small, the right technology would just have to be compacted into a small volume. The second part of this camera would have to be an accompanying video camera so the surgeon would be able to see where he/she is in the brain. This would allow the camera into certain regions and specific places (prefrontal cortex, cerebrum etc). At this point in time, with technology rapidly advancing at the rate it is, I would give this technology another 15-20 years to be created. A lot of the parts needed are existing at this point in time, its just putting the pieces of the puzzle together and then testing it to make sure it is accurate which could take up to 5 or 6 years in itself. Overall, I think this type of technology would be a great addition to the types of brain imaging we have. We have so many different brain imaging types that could work together and I believe this would make a huge victory in the medical field and if the technology is created right, save many lives and help to expand the existing knowledge we have of the brain. This entry was posted on Sunday, August 10th, 2014 at 2:06 am and is filed under Uncategorized. You can follow any responses to this entry through the RSS 2.0 feed. You can leave a response, or trackback from your own site.